Werling & Sons was established in 1886 by a family devoted to supplying the finest quality beef, pork, chicken and turkey at the best prices. We are truely family owned and operated and proudly stand behind our name. Through the years many things have changed, but one thing has remained the same. THE WAY WE DO BUSINESS AND TREAT OUR CUSTOMERS. We believe that a company should be proud of its products, and its employees. We value each and every one of our customers and employees. We are grateful for the opportunity to serve them. 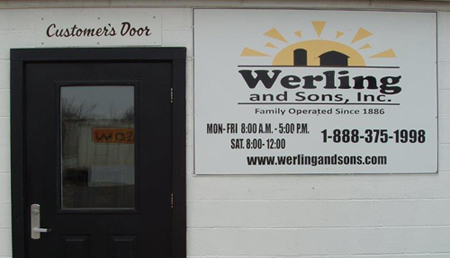 Werling and Sons is now in the 4th Generation and has seen many changes. For many years Werlings operated a local butcher shop dealing largely with local families and farmers. In 1966, beef was canned and the opportunity for more canned meats was realized. Today, we offer a large variety of canned meats that are enjoyed not only locally, but throughout the country. We pride ourselves in the QUALITY OF OUR PRODUCTS AND CUSTOMER SERVICE.